Hello everyone in Perth, Western Australia! This Saturday is the Burda StyleClub Potter Textiles special opening. Potters is the retail outlet of a designer fabric wholesaler, and the treasures in the shop are the stuff of whispered conversations. If you’ve never been, this is your chance. The shop is usually open only weekdays 10-4pm, but Simon has agreed to open it up for Burda StyleClub Perth members and friends for a special Saturday morning, Saturday 9 August, 9am-12pm. Tell your friends! As well as fabric off the roll, there are great tubs of remnants of the most inspiring kind. The prices for exquisite silks, linens wools and beautiful prints and wovens are very, very good. There’s also a very nice deli a quick stroll up the road for a post-fabric-purchase cuppa and chat. The shop is at 3 Auckland Street, North Perth. There’s no sign, but it’s next to Del’s Autos. If you happen to have some clothes made in Potter fabric – wear them! 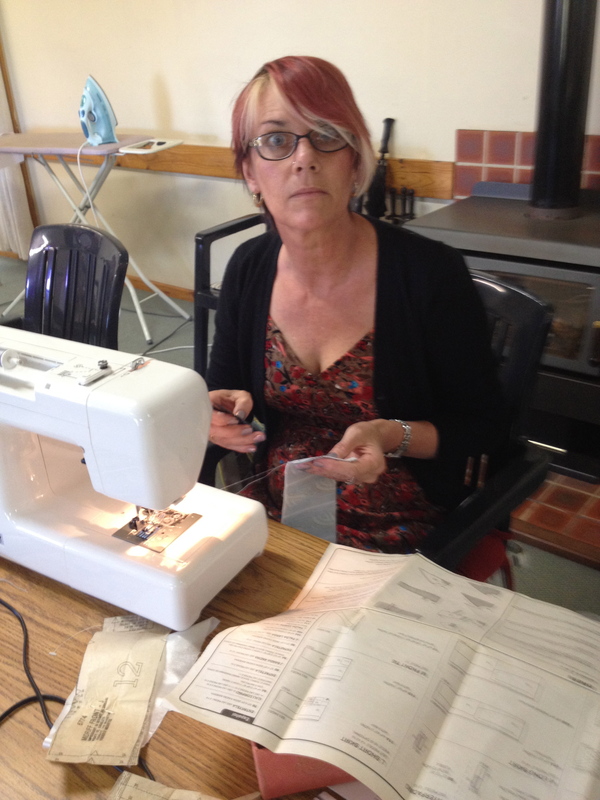 A few pics from the March 2014 Sewing Camp. A BIG thankyou to Elle for all your planning/organizational/culinary skills, without which this camp would not have happened. 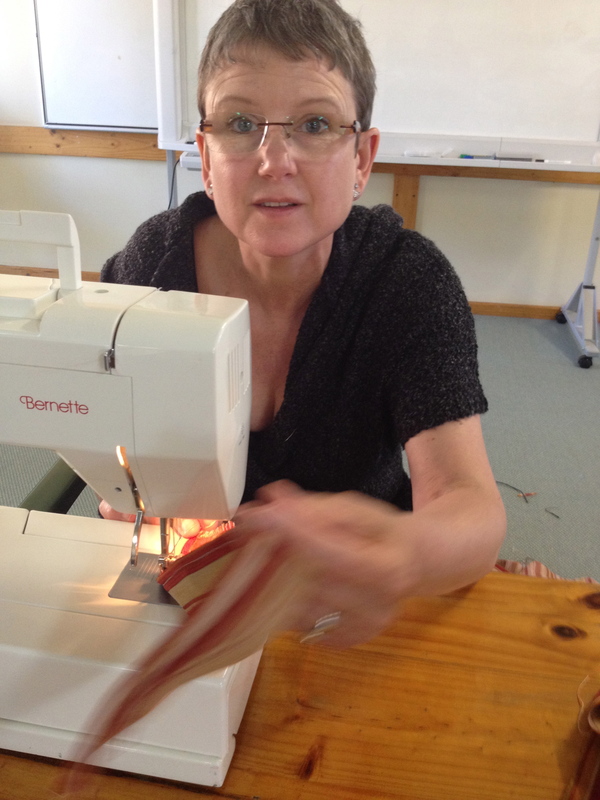 Now it’s not a sewing camp without some actual sewing going on….here are the ladies who put the “[sewing machine] pedal to the metal”during sewing camp weekend. I made a pledge at the beginning of last year not to buy clothes I could make. This is easy enough for dresses, tops and skirts. Doable for knickers, although bras are another proposition, and something of a challenge with knit fabrics. But! I gritted my teeth, fitted a stretch needle, found a lovely pattern and did it. So, with her patient and intuitive instruction I have a pair of recognisable jeans. The only real difficulty came with trying to sew the waistband. 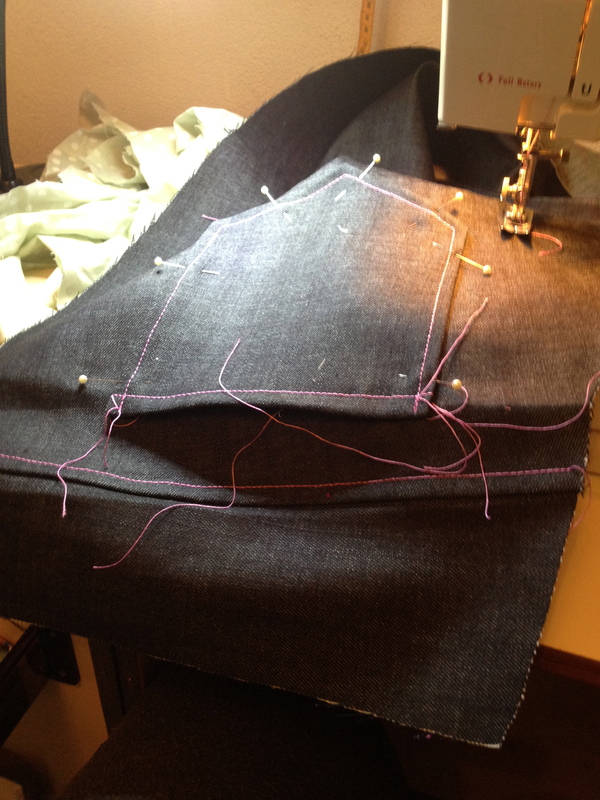 The denim I’d chosen is rather heavy – I liked the colour – and six layers of top-stitching was beyond my Janome. But Sandra has an impressive Singer that handled it without complaint. Likewise the buttonhole. I’ve not worn them yet, it’s too hot, and there’s one more touch I’d like to add. I’ve got a rivet kit, but I need to dig out my leather punch as my awl isn’t up to penetrating the four layers at the corner of each pocket where a rivet should go. I have worn these, though. 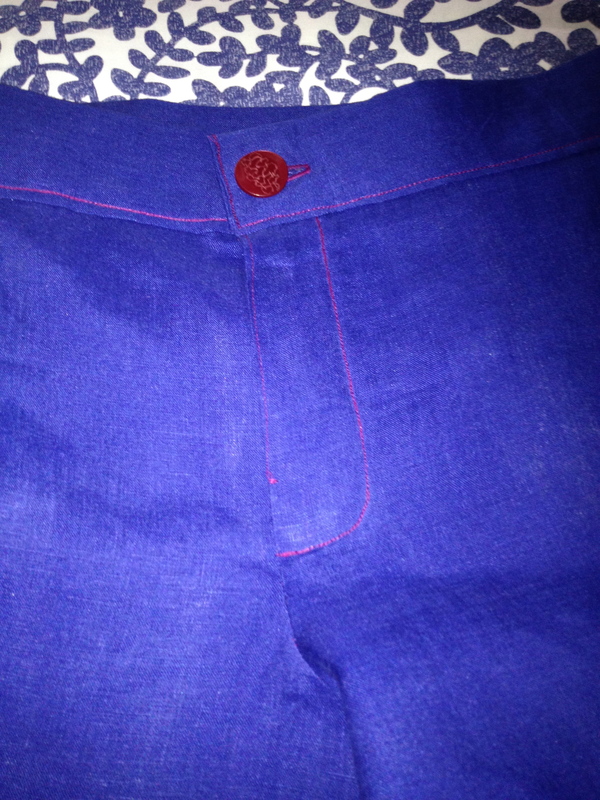 They’re indigo linen and don’t even crease too badly. For a hot day at work, they’re chic and cool and go with a lot of my wardrobe. The linen was also sufficiently light that I had no trouble with the waistband or buttonhole. The pattern I’m working off is a much-adapted block. It’s flattering to my body shape with wide legs and a yoke back. Doesn’t everyone need ridiculous trousers? The fabric is drill from LargeCraftandFabric chain store which I couldn’t resist. Sadly, not much seems to go with them, but they do make me smile! 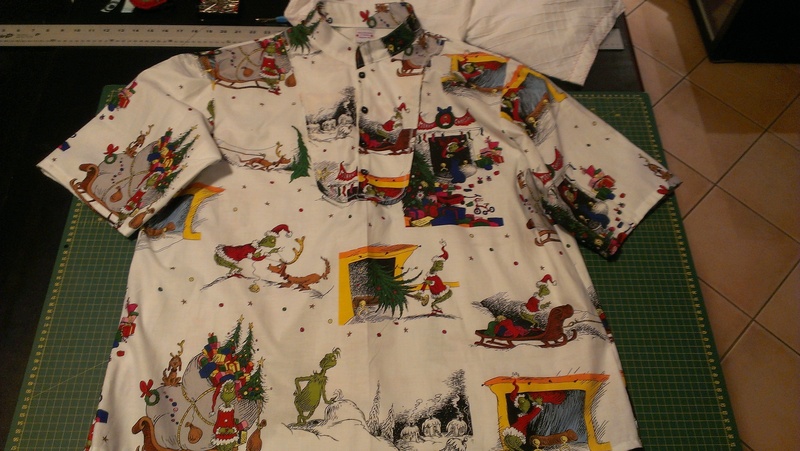 Okay ladies as a few of you maybe aware I do not like posting on our site unless it is Burda based, hence I can post about this shirt I have just made for Jeff for Christmas, and yes you are right upon closer inspection it is The Grinch That Stole Christmas material, he picked it and said he would wear it so here we go !!!!! Have a fantastic Christmas one and all…. The next meetup is the 15th of December so please go to http://www.meetup.com/BurdaStyle/Perth-AU/1060962/ to RSVP if you are coming. This meet is at my house and the address and directions are in the comments of meetup. I have a pool so you are welcome to bring your bathers and sneak out for a swim, extra points if its made from the bombshell pattern! Last year we had a Christmas ornament swap which was a lot of fun so we are doing it again. Basically make an ornament, wrap it up and then we swap anonymously. Check out the following links for ideas. 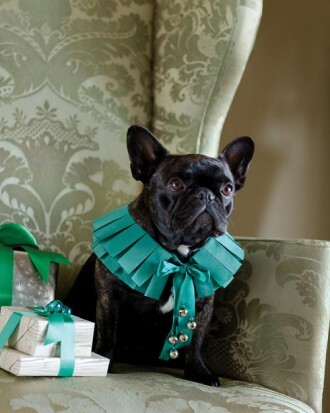 And here is one from Martha Stewart, dog not included. After the excitement of the Sewing Weekend Away, now also known as Sewing Camp, the November meet a week later was rather subdued. Still, Sandra, Sarah W, Irene and I trotted along to Brenda’s house and had the nicest afternoon. It was positively intimate, and we had wine and nibblies. I managed to throw together a pair of loose, drawstring, summer shorts, Irene was working on the most fabulous Harry Potter cushion and Sandra knitted (?) knat? I’m ashamed that I didn’t see what Brenda and Sarah were working on – perhaps they’d like to blog their projects? Brenda’s place, by the way, is furnished with some absolutely gorgeous vintage pieces. The woman has style. Stay tuned to the Meetup site for the December meet. We’ll do the Christmas ornament swap (so start beading!) and wish each other Merry Christmas. Usually we take January off, but that’s not set in stone. Does anyone want to host a January meet? And – would anyone like to get together over afternoon tea to do some planning for next year? Perhaps we could go back to some dedicated workshops? Remember the knicker afternoon? ends up on the blog! It was a great weekend. Unlike the last one, there were no car dramas, and we had the delight of a semi-tame kangaroo hopping around peering curiously at us. The weather was gorgeous and some of us ended the weekend with a dip. Much wine was drunk and quite a lot of sewing happened. We’re talking about the next one in April-ish next year. 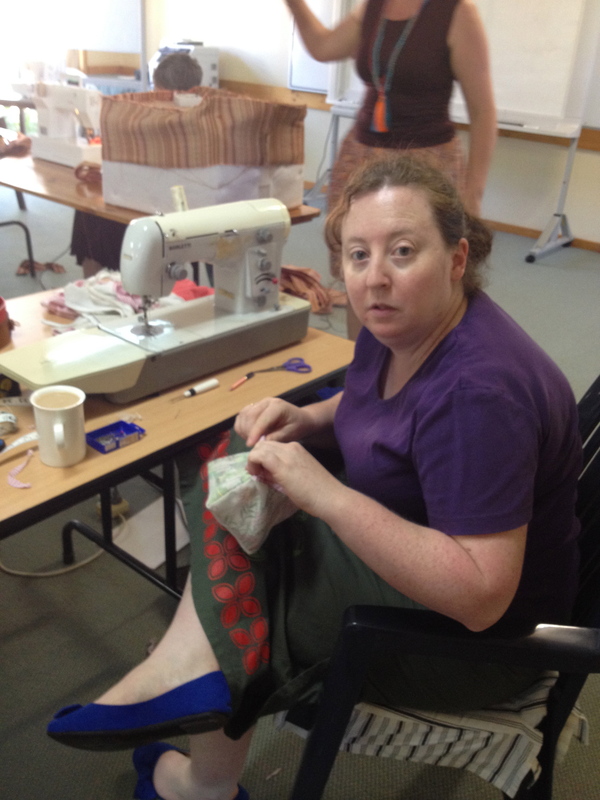 Here’s Zoe concentrating hard on her hand sewing. Vanessa, on the other hand, was warned and ready for the camera. Kate was concentrating far too hard on her pattern alterations to even look up. 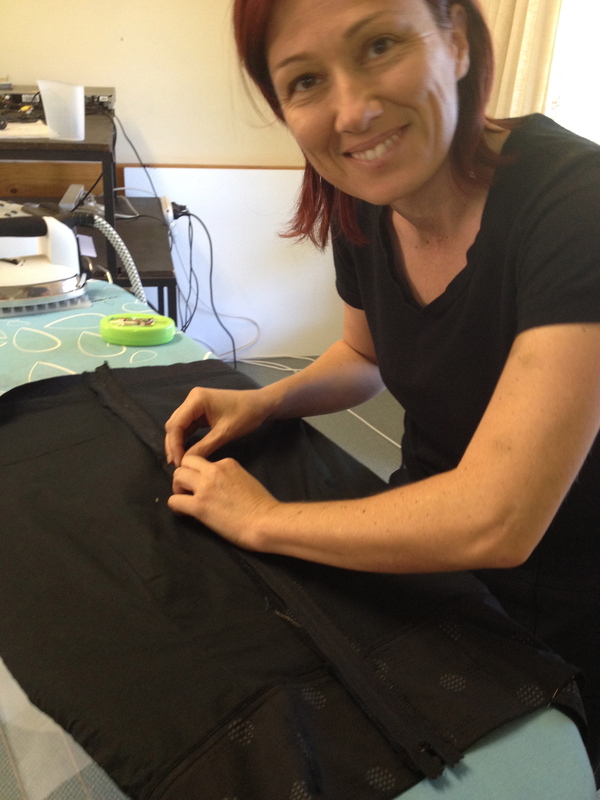 Helen brought along a project that’s been waiting for some uninterrupted sewing time for quite a while. 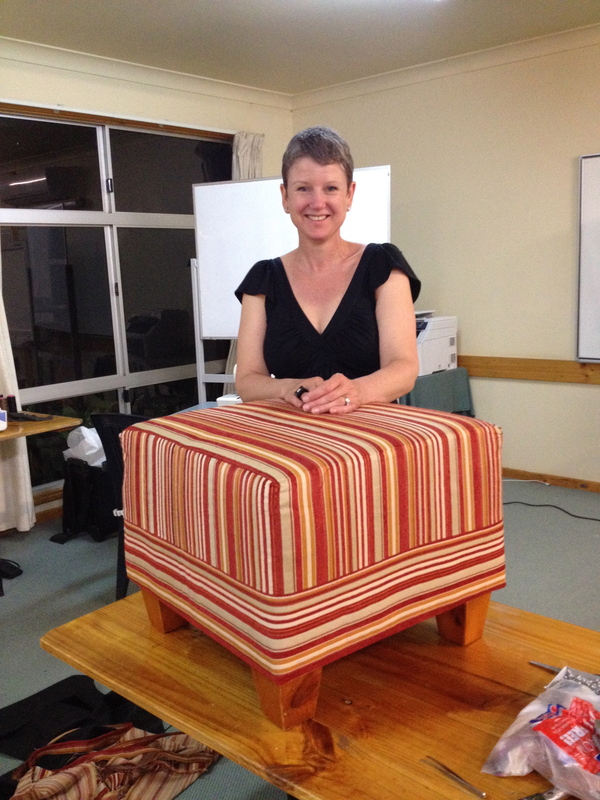 And here is Helen’s refurbished, verge-collection footstool. There was hammering involved and some very bad language at a couple of points! Calling for Perth blogging contributors! 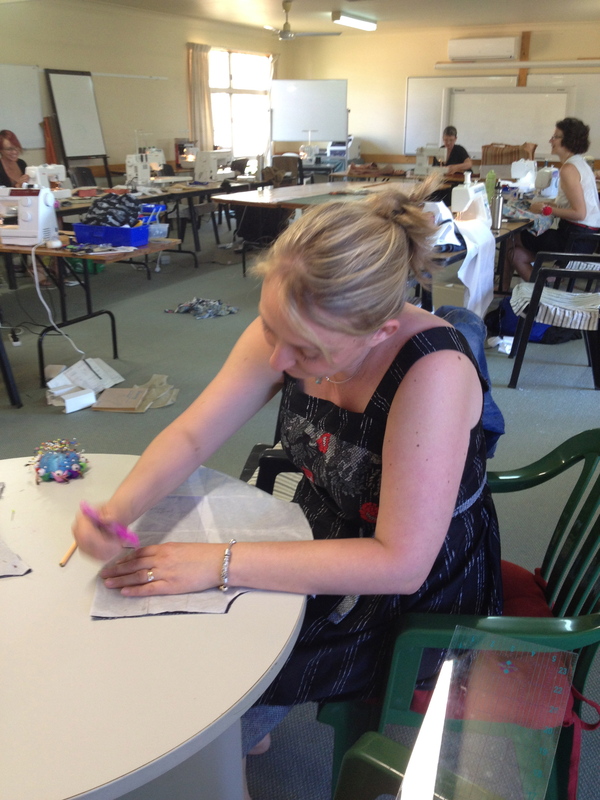 Burda Sewing Weekend Away 2013 – Fleur’s photos! January 6, 2013 – Unveiled! Want to get featured right here on our blog? Send your favourite picture and a brief description of your latest project to bscperthwa@gmail.com and we'll put you in the spotlight! Pattern Magic dress for work! A bridesmaid in a Crepe dress!